New to Victuals & Co – especially for couples in love! Celebrating a wedding anniversary? Want to propose? Special event? Or just looking for that extra privacy? If so, when booking a table for two ask for our ‘Lover’s Table’. 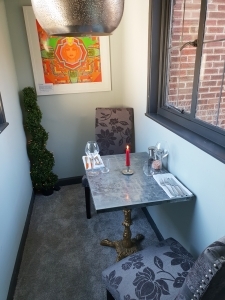 Tucked away upstairs above St George’s Passage and with views to the High Street and St Georges Church, our small private area offers the most exclusive area of privacy for two people to enjoy each other’s company and fine dining in our restaurant.